A Texas shooter put together a great video covering the East Texas Championship Benchrest Shootout, held August 20-21 in Huntsville, TX. This match, the first at the new Huntsville Range, was co-sponsored by the Pine Valley Benchrest Shooters Association and S&S Precision Rifles of Argyle, TX. On the Friday before the main match, there was also a 500-yard Egg Shoot. In the video you can see Don ‘Stick’ Starks of S&S piloting a 6.5×47 Lapua long-range varminter he built on a candy-red Robertson Composites ‘Speedy’ F-Class stock. Stick and other competitors were shooting at large (120mm), medium (90mm), and small (60mm) clay birds at 400 yards. Over the course of the day, competitors fired 50 record rounds at the targets. Each shooter came to the line five times to shoot 10 rounds per stage in seven minutes or less. The ‘top shot’ who nailed the most birds took home $600.00 in cash. There was also a team challenge with a $430.00 winning payout. Thirty-six competitors attended this fun match with $1300.00 in total prize pay-outs for the top four bird-busters. Jason Leavelle won the $600 first-place prize with an 810 score, while Dr. Darrel Martin earned $400 for his second-place finish, 50 points behind Leavelle. Tymn Combest was third, earning $200, and Arthur McMeans took home $100 for fourth place. Pudge Morris was the Junior Division winner. We congratulate all the money winners — it wasn’t easy. According to Mike Cockcroft, who helped run the match, “it was 100 degrees, the winds were strong, and the mirage heavy.” The only wind indicators are range flags at the targets and a couple of standard benchrest flags out at about 100 yards. You should definitely watch the video. It is extremely well made and there are some seriously nice rifles on display. Plus it sure looks like the new Huntsville facility is a beautiful range (even if the Texas winds did blow in the afternoons). CLICK HERE to download Match Rankings and Scores (PDF File). 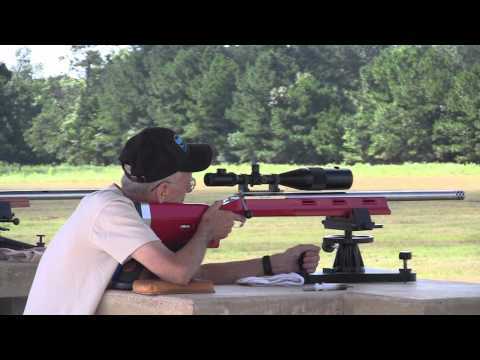 Share the post "East Texas Championship Benchrest Fun Shoot"
Bob’s 450-33X score beat the old Camp Perry National Championship mark by six Xs. 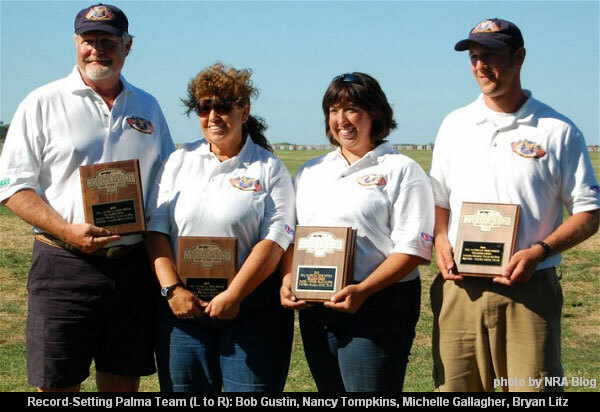 The previous record of 450-27X was held by Bob’s Palma teammate Nancy Tompkins-Gallagher. Just to show there were no hard feelings, Nancy and her daughter Michelle Gallagher joined Bob along with Bryan Litz to set a new Palma Team Match record of 1796-119x. Bob started shooting on the smallbore range. Then, in 1980, he switched to reserve shooting with the service rifle section until ultimately moving to High Power in 1990. Now, twenty years later, he’s perfected the shot and found more time for the range. After retiring from a 31-year stint on the California Highway Patrol, Bob now gets to do what he really loves. Historical Note: Bob’s 450-35x is a record for the Palma match at the Camp Perry National Championships. However, the absolute National Record for any American Palma Match still belongs to John Corning. John fired a 450-39x at Forbes Range, Colonie, NY in 2007. 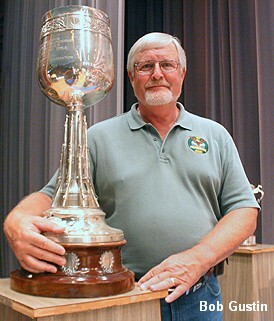 Share the post "California’s Bob Gustin sets Palma Records at Camp Perry"
The Steel Eagles Junior Rifle Team from Pennsylvania is one of the nation’s top junior squads. The Steel Eagles two-person junior team of John Yates, 18, and Brian Deyoung, 15, took top honors in the At-Large category of the National Trophy Junior Team Match. The Steel Eagles may be the only Junior team in the country with three sisters shooting together. The three Horomonski girls, Elyse (age 19), Jenna (age 16), and Marie (age 14) all compete with the Steel Eagles. 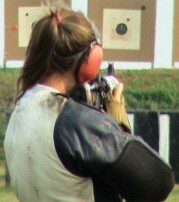 Elyse shot her personal best at Camp Perry this year. Father Curt Horomanski, of Monroeville, PA, says he’s happy to provide shooters for the Steel Eagles junior rifle team. His oldest daughter Chessa, 22, recently graduated from the junior ranks but he still has three daughters shooting with the Steel Eagles team, affiliated with the PA Rifle and Pistol Association. 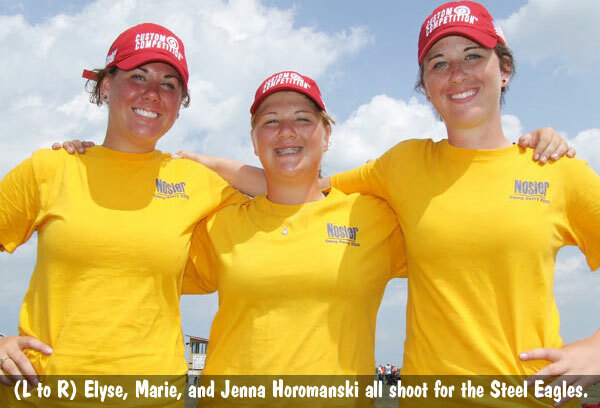 The Horomanski sisters, Elyse, Jenna, and Marie, have each been shooting High Power since the age of 12. They follow the sibling shooting tradition set by eldest sister Chessa, a tradition they hope will continue on with their eight-year-old brother. Story courtesy CMP Online Magazine; top photo from Steel Eagles’ Facebook page. Share the post "Three Sisters Shoot with Top Pennsylvania Junior Squad"